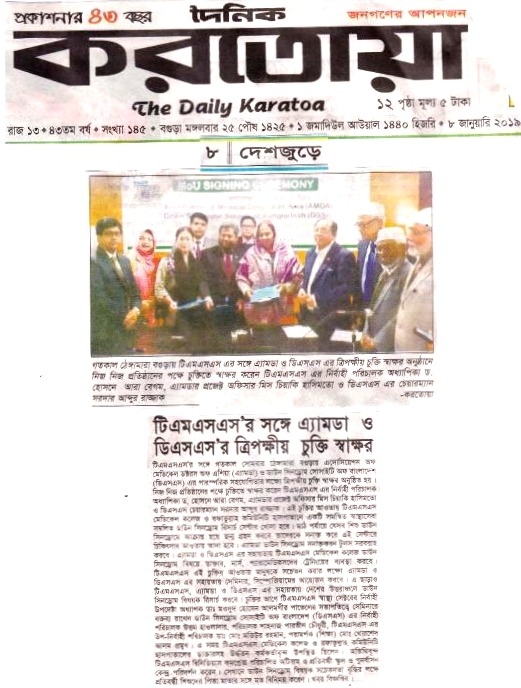 On the 7th of January 2019, AMDA signed a Memorandum of Understanding with a notable Bangladeshi NGO, TMSS (Thengamara Mohila Sabuj Sangha) and DSS (Down Syndrome Society of Bangladesh) to cooperate in the areas of disaster preparedness, disaster management, elderly care and Down syndrome based on the spirit of “Sogo-fujo”(mutual assistance), a motto which embodies AMDA’s core principle. Based on this tripartite agreement, the three parties will work hand-in-hand to propagate awareness and efforts in the said fields. Founded in Bogra in the northwest of Bangladesh in 1964, Thengamara Mohila Sabuj Sangha (TMSS) has been actively promoting capacity building of women, eradication of poverty and self-employment initiatives, especially after the organization set its focus on women in the 80s. Having over 800 branches with 8,000 employees under its wing, TMSS manages a wide array of projects and social business around the country which include microfinance, education, health, food security and life-related assistance. The NGO has been a major player in the nation’s social welfare/development sector for more than three decades. Headed by AMDA Bangladesh director Sardar A. Razzak, the Down Syndrome Society of Bangladesh (DSS) is a platform for children born with Down syndrome and their parents. The sole purpose of this platform is to inspire children born with the syndrome by enabling them to help change the world and assist them in special needs advocacy, education, employment and social inclusion. As a self-funding, non-profit organization, DSS works closely and regularly with health and educational professionals and other voluntary welfare organizations. The Society is affiliated to national and international bodies such as the Department of Communication Disorders, University of Dhaka, the Down Syndrome International (DSI) UK, the Asia Pacific Down Syndrome Federation among other relevant organizations worldwide. Some of the items included in the foci of this partnership are, “Having the world come together to address the social inclusion of people with Down syndrome” as well as “Establishment of a medical resource center for people with Down syndrome that provides comprehensive health-related services”. Through collaborative research and training, the three parties are expected to seek sustainable ways in extending a helping hand to change the lives of those in need. After the MOU signing ceremony, the officials and guests paid a visit to a facility (run by TMSS) for children with Down syndrome, autism and cerebral palsy, and their parents. There, children including the youngest son of Mr. Razzak who has Down syndrome, showed dance performances which received a big round of applause from the audience. After the memorial photo session, the event ended successfully with all participants deepening their bond.